When I am in a restaurant in France I try to order dishes that are difficult to get in NYC. On this trip so far, I have enjoyed rabbit, gizzards, pigeon and bull. 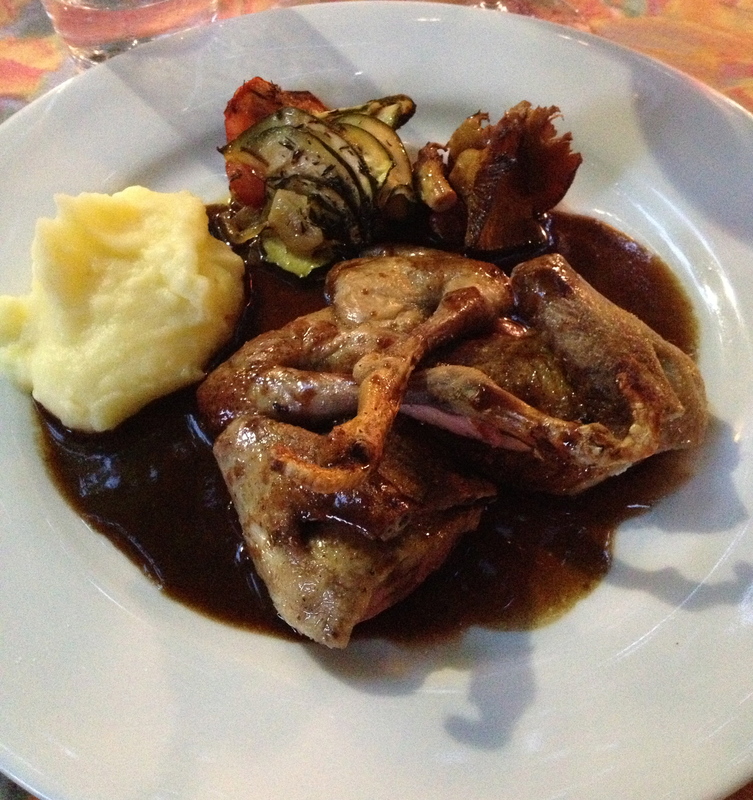 This is a very charming restaurant with outside dining in a courtyard of a farmhouse with very good Provencal food. 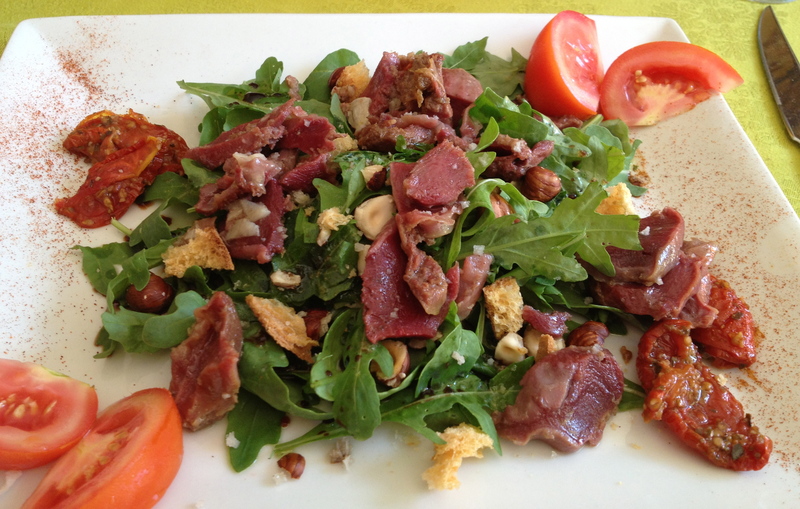 I started with a salad of arugula and gesiers, confit gizzards, with hazelnuts and sun dried tomatoes, followed by braised rabbit with rice. 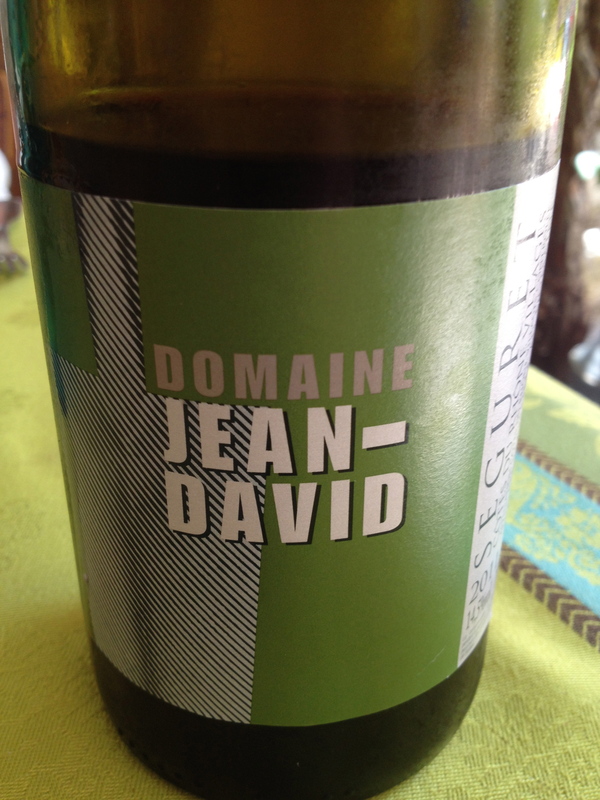 To go with the meal I ordered a bottle of Jean David Red Blend Cotes-Du-Rhone 2011 72%, Cinsault 10%, Carignan, Counoise 6% and the rest Syrah and Mourvedre. Located within walking distance from the restaurant, the vineyards and winery are organic certified. All work in the vineyards is done by hand and the soil is clay and limestone. There is no de-stemming. Fermentation is with indigenous yeasts and varieties are co-fermented. Both fermentation and aging occur in stainless steel or concrete. The wine is aged in concrete for one year. Bottling is done without fining and filtration and with minimal SO2. The wine has aromas and flavors of red fruit and a hint of spice. It is a well-structured wine and goes very well with food. 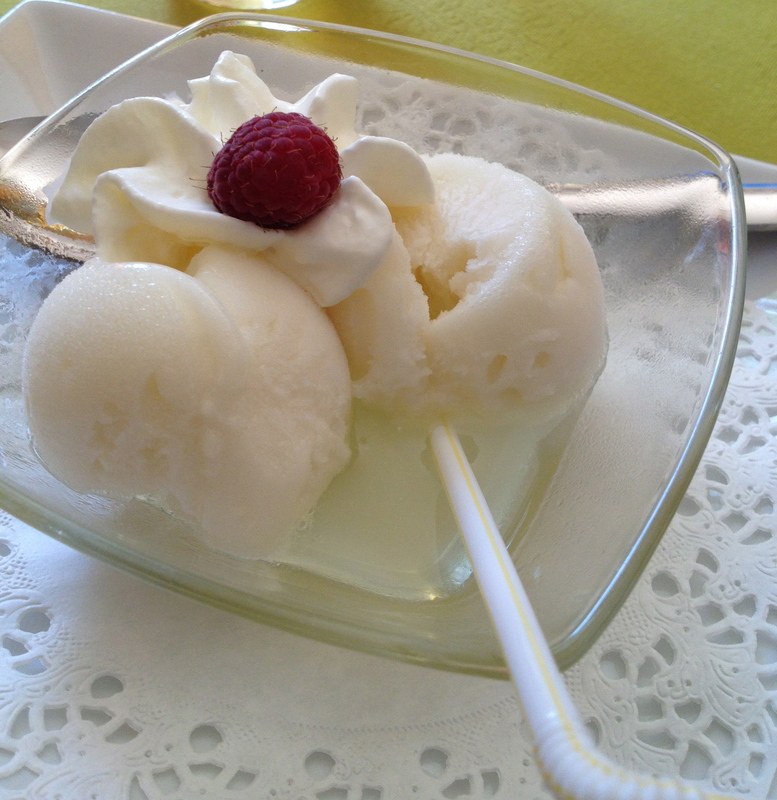 Our dessert was simple yet bracing, lemon sorbet drizzled with limoncello, and topped with whipped cream. The restaurant is situated in a hill top village with a lovely dining room and covered terrace with great views. 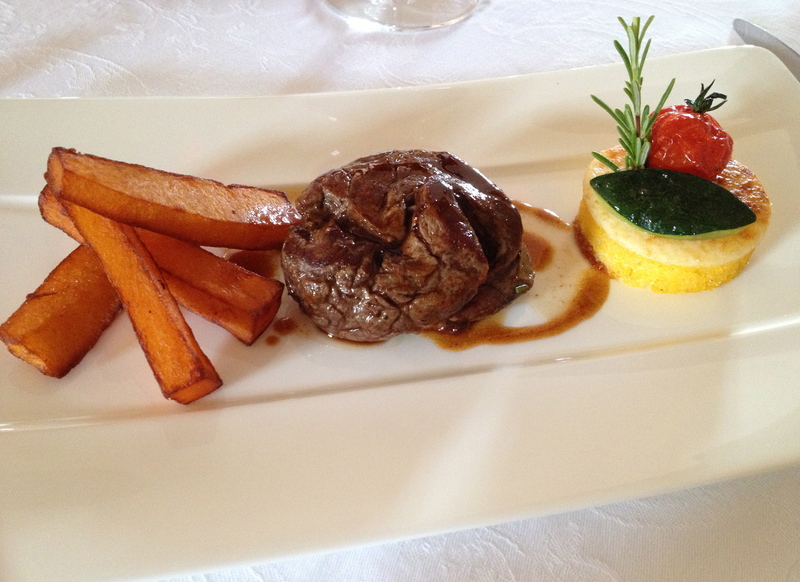 I ordered foie gras to start and then had roasted bull filet with red wine sauce. The meat was chewy with a deep beefy flavor. Fries made from butternut squash were a delicious accompaniment. This restaurant was a little out of the way but it has a great wine list featuring the wines of Côtes-du-Rhone, Chåteauneuf-du-Pape and Hermitage among many others. They are also known for their truffles and have an entire truffle menu. I started with sautéed foie gras with a puree of apples and Michele had a truffle omelet, which she really enjoyed. For the second course I had pigeon, which was excellent. Chãteauneuf –du-Pape White 2011 Domaine De Nalys Grenache, Clairette, Bourboulenc and Picpoul are put into temperature controlled stainless steel tanks and fermented at 18 degrees C. Rousianne and Picardan are barrel fermented before blending with the other varieties. Maturation takes place in tanks for 8/12 months. The wine does not undergo malolactic fermentation. Bottling is very early to keep the wine’s aromatic freshness. This is a wine with subtle citrus aromas and flavors with good minerality and a savory character. 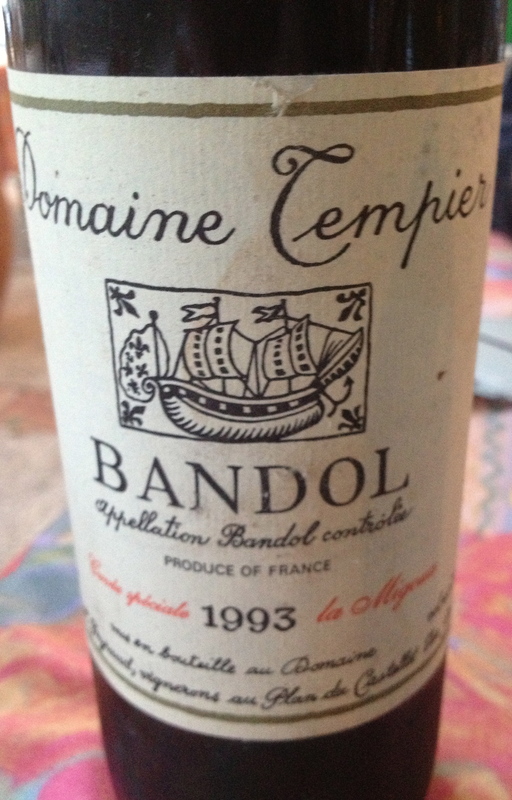 Bandol 1993 Domaine Tempier made from 70/75% Mourvedre, 14/16% Grenache,8/9% Cinsault and 2/3% Carrignan depending on the vintage. The soil is a mix clay and limestone. Traditional tilled soil, both mechanically and by hand, without the use of herbicides. The vines are treated without any chemical fungicides. Grapes are harvested by hand and carried in small bins 30kg. Clusters are hand selected in the vineyard and in the cellar. After destemming traditional fermentation takes place with natural yeast for 2/3 weeks in temperature controlled stainless steel vats. After pressing, the wine is put into large oak casks 25/75HL to complete malolactic fermentation and to mature for 18/20 months. The wine is bottled without fining or filtering. This was a very impressive wine showing no real sign of age. 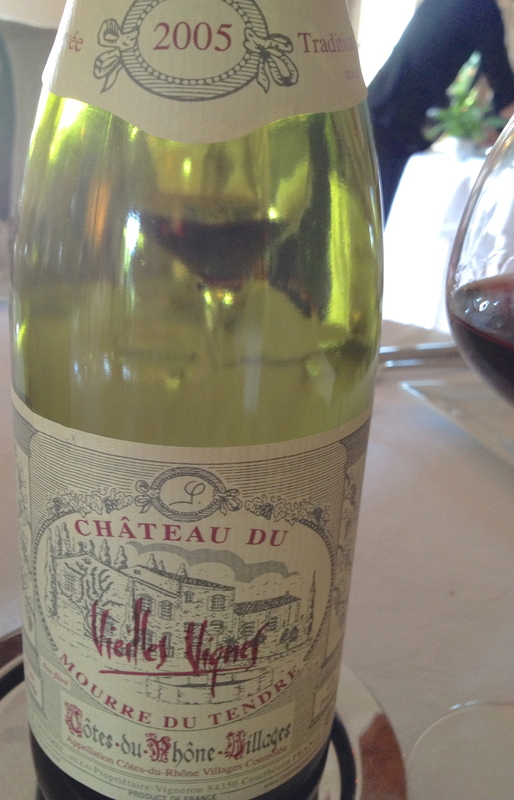 It has black fruit aromas and flavors, with hints of leather and spice a long finish and a very pleasing aftertaste.